This article has new content coming soon and may not be complete, confirmed, or correct. Please update it as soon as any relevant and accurate material is available. Editors must cite sources for all contributions to this article. Edits that do not follow this standard will be reverted without notice. For more information, see the Citation Policy. "Wizards, lead your followers in battle. Take enough devastation to feed your worm, and a little more to grow, and take the tithe of your followers. Then take another portion, as much as you dare, and use it for your own purposes. But if it is too much, your peers will kill you and take it. Then tithe the remainder to the Ascendant you serve." Wizards are a powerful caste of Hive. They wear long, crumbling robes and fly overhead to unleash their spells, drawing on the power of the Darkness to fuel their powers. "The only word for what we saw is sorcery." Wizards are often frustrating opponents on the battlefield, being able to unleash long range darkness blasts in rapid succession while swiftly flying around. The higher the Wizard is ranked, the faster they fire them. In addition, they can plant down poison clouds that deal damage over time, blur the player's vision, and slow them down. 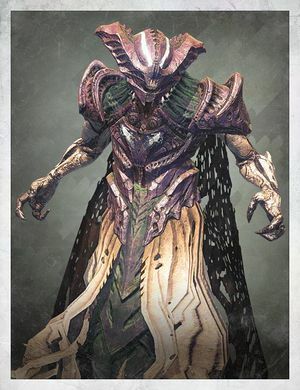 The vast majority of wizards come with Solar shields, except for Omnigul, who comes with an Arc shield. But once the shield of any Wizard is picked apart through concentrated fire, their defenses are effectively shut down, leaving them fully vulnerable to Guardian attacks. In Destiny 2, Wizards on Titan appear largely the same along with their abilities. Most appear with Solar Shields but a special few, such as Savathûn's Handmaiden, have Void Shields. Deathsinger—these Ultra wizards are encountered exclusively in Raids (apart from Story mission Last Rites), and will kill the entire party after a certain time limit if they are not killed beforehand. Waker of Crota—encountered exclusively in Siege of the Warmind and The Wakening. Wakers of Crota glow green and are capable of summoning traps called Vestiges. Vestiges damage players who walk over them. Killing Wakers will prevent more Vestiges from appearing. The phrase "That Wizard came from the Moon!" (as uttered by the Ghost) has become an infamous line among the Destiny community. Bungie has released a shirt and a poster in recognition of the meme. All Wizards are females capable of reproduction, either sexually or asexually through parthenogenesis, besides Nokris, who is the only known male Wizard. Early concept of the Wizard. A Wizard floats on the air. Close-up view of Pre-Alpha Wizard.